The Fyodorovskaya Ikon of the Mother of God is the patron ikon of the House of Romanov and one of Russia’s most beloved ikons. The feast days are 27 March and 29 August. 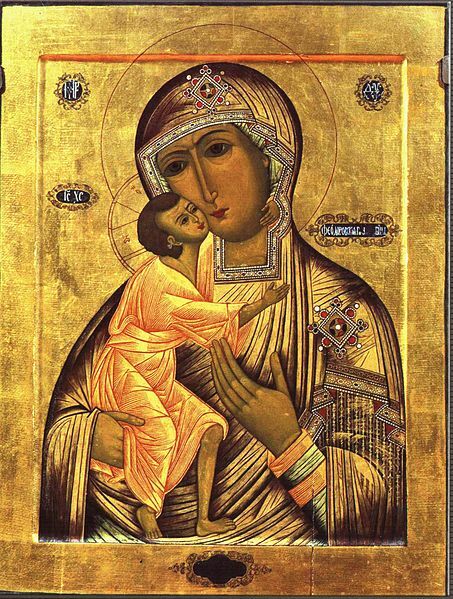 Like the overwhelming majority of Orthodox Marian ikons, it depicts Mary and Baby Jesus, instead of Mary alone, as is the case with most Catholic Marian ikons. 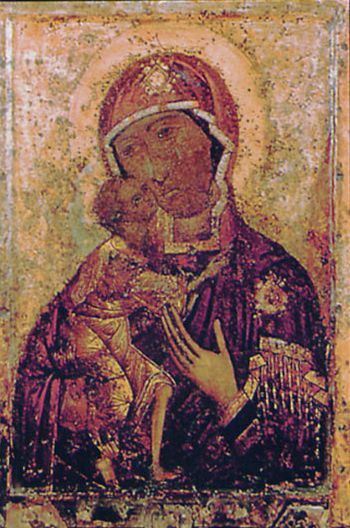 It’s very unusual to find an Orthodox ikon depicting only Mary. 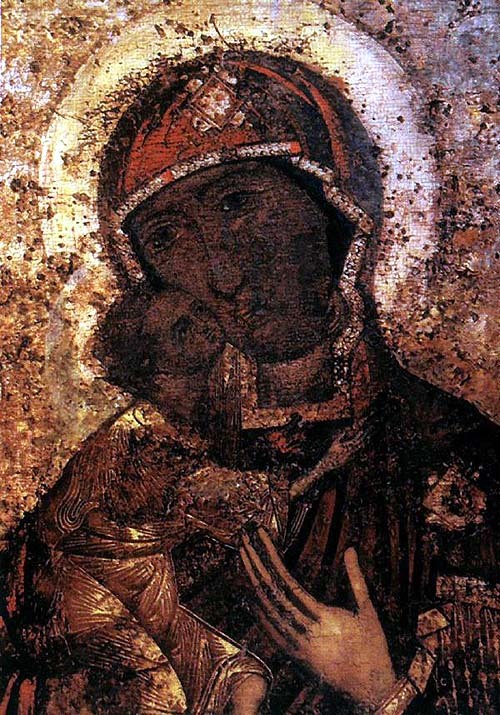 Since it so resembles the famous, widely-venerated Theotokos of Vladimir ikon, many people believe the Fyodorovskaya is merely a copy of that older ikon. 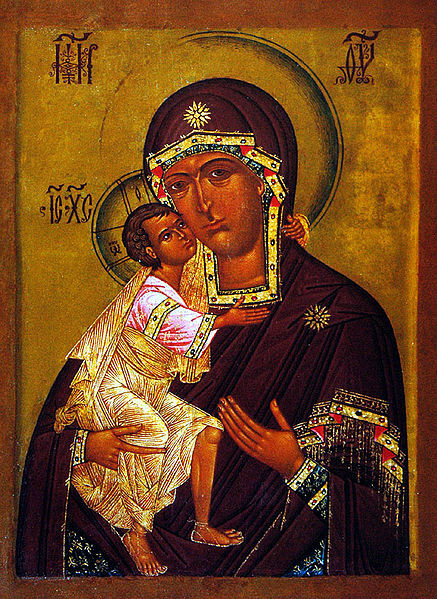 (Theotokos, which is Greek for “God-bearer,” is the title frequently given to Mary in Eastern Orthodoxy.) In the wake of the Mongol sack of Gorodets, the Volga town where it was kept, it disappeared and was given up for lost. As the story goes, on 16 August 1239, Prince Vasiliy of Kostroma got lost while hunting in the woods, and found an ikon among the firs. When he tried to touch it, it rose up into the air. Prince Vasiliy believed it a miracle, and went to get all the townspeople, who followed him back to the forest and fell on their faces in worship. The ikon was taken to Assumption Cathedral, where a fire soon broke out. Once again, the ikon miraculously survived. When the people of Gorodets discovered their ikon had been found, they demanded it back. Kostroma and Gorodets fought over it for a long time, till finally the people of Kostroma painted a copy and sent it to Gorodets. In 1613, 16-year-old Mikhail Fyodorovich Romanov received a copy of the ikon from his mother Kseniya, who’d been forced into a nunnery by the villainous Boris Fyodorovich Godunov. Kseniya was very frightened when her son was offered the position of Tsar, since things hadn’t gone very well for the last few people on the throne. However, she ultimately blessed Mikhail, and gave him that ikon to protect him and his descendants. The new Tsar Mikhail took the ikon back with him to Moskvá, and thus it became his family’s special protecting ikon. This ikon is the reason so many foreign brides took the patronymic Fyodorovna when converting to Russian Orthodoxy. Over the years, several other cities requested copies for veneration, some of them quite ornate and fancy. It should be stressed that the Orthodox don’t pray to ikons, but rather venerate them, asking these saints to intercede with God on their behalf. During the Romanovs’ tercentenary in 1913, Nicholas II commissioned a copy of the Gorodets original. However, at this point, it was impossible to work from the original, since it had become so badly blackened over the centuries. This was interpreted as a very bad omen for his dynasty. Since the image has become so corrupted, the ikon hasn’t been donated to a museum like other ikons. Today, it has a home in Epiphany Cathedral in Kostroma, after surviving so many calamities over the centuries.